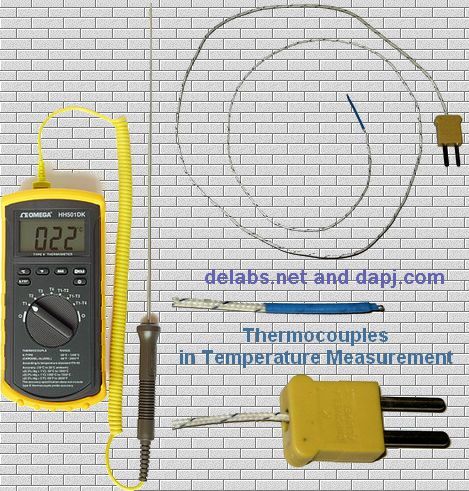 The easiest way to measure temperature is with a glass diode like 1N4148 or a metal Transistor like 2N2222. These have a small temperature range, probably -5 to +120 is possible, but non-linear. A copper coil or any metal wire or even a wirewound resistor can work as temperature sensor but the thermal inertia makes it sluggish. IC semiconductor based sensors like LM335 and AD590 are easy to work with and pretty accurate. 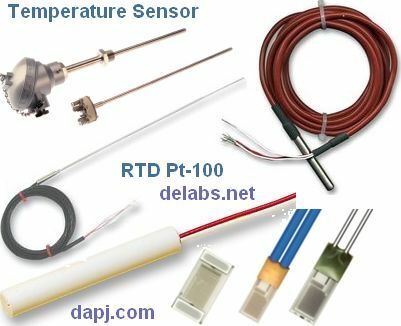 In industrial environment many types of Thermocouples, Pt-100 RTD and Optical Infra-Red Temperature measurements are used. More at the Temperature Measurement Section. Temperature is the most important process parameter. Measured, Displayed and Logged in home, industry and lab. Semiconductor and IC Sensors, Thermocouples, Metal Wire-wound Sensors, Pt-100 RTD, Thin Film RTD are used. Input Levels for Thermocouples and RTD Pt-100. And the ways it can be used. Thermocouples are selected on the basis on how they are mounted or fixed, the environment, the temperature range that is measured and finally the price. you can afford for a particular application. Sometimes mechanical wear or chemical environments may eat away the sensors, so a cost-effective solution has to be evolved. One customer wanted a special Pt-PtRh very high temperature sensor for molten aluminum. It was very difficult and costly to even arrive at a solution. So a non-contact infra-red sensor may save a lot of time-money and even reduce risk of injury. For J, K, and T Thermocouple Read "Temperature" + Room Temperature for mV shown applied to equipment, eg. 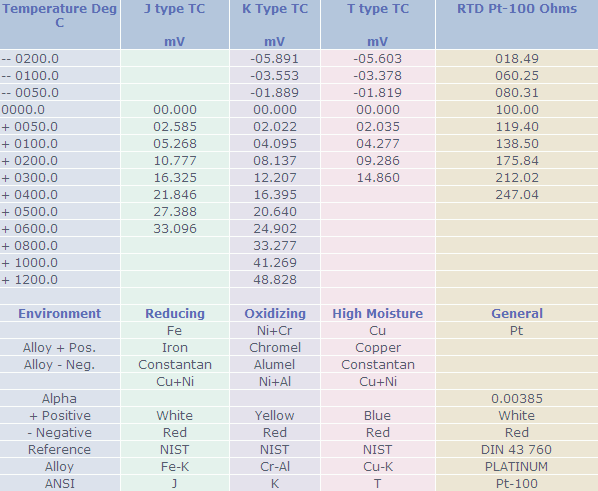 If Room Temperature is 25 Deg C and mv applied is 10.777 for J Type STC1000 then reading should be 200 + RT = 225 deg C. The mV shown are for Reference Junction at 0 Deg C.
The image below is a collection of the types of RTD Pt-100 Sensor. Some are Small Filim based like the resistors. Some have a thin RTD Wire that measures upto 100E. Platinum is expensive so it has to be very thin, the construction is fragile and delicate process. Once encapsulated in a metal or ceramic body, it is robust to chemicals and vibration. Still need to take more care in comparison to the rugged thermocouples that can manage high-temperatures and mechanical shocks. RTD is ideal for precision Low temperature control systems. Weather Monitors and Fluid Temperature control. An image of the same table above, it may be easier for you to store and read in your portable computer.